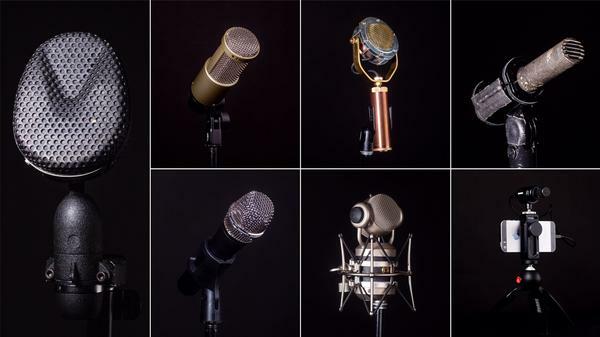 Choosing different mics to capture a variety of instruments is an art form. There are countless options at different price points and there are no right answers. EQ adjustments to treble, bass and midrange frequencies can make an inexpensive mic sound good. Mic placement can change the sound dramatically. Whenever I'm not sure how to record an instrument, I move my head around until it sounds nice, then I replace my head with a mic. (Trade secret!) Also, what does the room sound like where you're recording? Are there a ton of reflections or reverb that could affect clarity? Are the lights buzzing or is there a humming refrigerator in the background that could be unplugged? Are you outside and need a dead cat windscreen? The somewhat (ahem) iconic Sennheiser MKH 418-S.
Recording in stereo allows the listener to localize sound, which can provide a more vivid soundstage, especially with headphones. There are many types of microphones and each have a unique sound. The more you discover them, the more you'll find what you like best. And, like every art form, it's all subjective. Mid/Side — One cardioid and one bidirectional mic used in the Sennheiser 418-S shotgun mic. Great stereo to mono compatibility when you listen in mono plus it has an adjustable stereo width. ORTF — Two cardioid mics on a stereo bar, set at a 110-degree angle. I use this setup behind the upright piano for a wider, more spacious sound. Spaced Pair — Two parallel, omnidirectional mics set a few feet apart, which I use to capture the audience from above the Tiny Desk's wide shot camera angle. Using more than one mic gives you a lot more control over the balance of the instruments, and handheld dynamic microphones are the most commonly used for vocalists. But use caution; it can be tricky to avoid plosives if you work them too close. This is the mic you see on almost every stage in the world, the venerable Shure SM58. Ironically, "SM" is short for Studio Microphone. It's designed to reject everything but what's directly in front of it, with an EQ curve meant to enhance vocals and suppress plosives. It's also quite durable. This handheld stage mic has a clarity traditionally reserved for more expensive condensers. 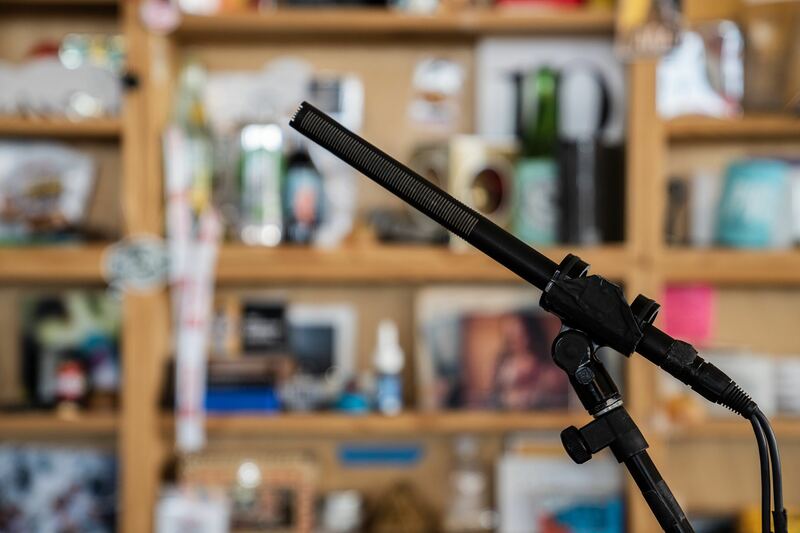 I've seen a lot of artists travel with these mics to replace the in-house SM58's, like Cautious Clay recently did for our first-ever Tiny Desk Family Hour at SXSW. You can order them in almost any color, which makes these mics really pop visually on stage. There's nothing like a large-diaphragm dynamic mic on a kick drum (or a podcast host, for that matter — pull it out of the kick drum to record your next show for warm and intimate spoken word.). The PR 40 has a wide frequency response, helping to capture the thump and snap of a good kick drum. I use the less expensive PR 31 BW ($270) in front of guitar amps, because the warmth and depth is richer than the ubiquitous, albeit less expensive, Shure SM57 ($100) — although the SM57 does sound amazing on a close-miked snare drum. When I sing into an RE20 I... look like a dork. But there's a presence and warmth that translates equally as well on a kick drum, like the one I captured with Nate Smith in his studio during Winter Jazzfest for our Night Owl Series. Like other high-end mics, it has a bass roll-off switch to help dampen plosives when using for vocals, or if you need to cut low-end rumble. Anything I put it in front this mic sounds great, with very little EQ. It has a bass roll-off switch to help with plosives and low-end rumble, plus a 10dB pad if you want more fader travel on your mixer from loud sources. I use a stereo pair in ORTF formation to record the piano for every Tiny Desk Concert, including my favorite performance (on a seven-foot grand) by Chick Corea. It also picked up the nuanced sound of Yo-Yo Ma's cello at Bob Boilen's desk with aplomb. I'm fortunate that NPR has collected a number of mikrofones [sic] over the years from Schoeps, a German manufacturer. I use a pair of MK2's about nine feet in the air above the wide-camera shot facing the Tiny Desk to capture the audience. I set a nine-millisecond delay on all the other sources to time-align all the mics, because sound travels slowly. Then, when I crank up the hanging Schoeps to capture louder brass instruments, I avoid the dreaded hollow sound created by comb filtering, because the sources are aligned by the time they're recorded to track. Small Diaphragm Miniature Condensers For Strings, Horns Etc. The beauty of using a clip-on is that it always stays on-axis, because you attach it directly to the instrument. The C519 M from AKG has a gooseneck adjustment to allow precise placement. If you look closely, I used it to record the Wurlitzer electric piano for Andy Shauf. DPA's d:vote 4099 is the instrument-clip-on version of their popular d:screet 4060 lavalier, which Wait Wait Don't Tell Me uses for all their panelists (and their host). The instrument version is supercardioid, to avoid bleed from other sources, and they make a variety of clips designed for cellos, upright bass, violin, drums, guitar, woodwinds, brass — even accordion. When string players perform, I always ask if they have DPAs, which saves a ton of space behind the desk. The clip-ons eliminate mic stands and leaves room for music stands, which (of course) many classical musicians use. Ear Trumpet Lab makes gear that looks like the audio engineer from a steampunk-themed Burning Man camp designed it; I used the Delphina for vocals at the Tiny Desk for Weezer and &More. The large-diaphragm condenser sounds warm and natural, and you don't have to get it too close to convey intimate, yet crystal-clear, vocals. I first saw an Ear Trumpet Mic when The Milk Carton Kids brought one to a taping of Ask Me Another, and I've enjoyed the sound (and look) ever since. The Milk Carton Kids uses the Edwina model designed to reject feedback in rooms with a PA.
Blue's mics are incredibly easy to work with. The mouse swivels and pivots in every direction, promoting mic placement experimentation to achieve the best sound, without having to fix it in post. It picked up the articulation on Raul Midón's acoustic guitar and the dynamics of Laura Lee's bass (from Khruangbin) on their Tiny Desk performances beautifully. At every mic position at NPR HQ, NPR West and NPR NY sits a Neumann U87. The mic is crystal clear — and a bit too bright on some voices, especially because we engage the bass roll-off. It can be switched to a bi-directional pickup pattern, so you can record two voices speaking on either side of it, or capture the "side" signal of an mid-side stereo recording. (You can also select "omni" to pick up more off-axis sources.) It's a nice mic with a huge price tag, and I never use it at the Tiny Desk — except as a very expensive prop. WNYC has an incredible microphone cabinet, and among them are four RCA 44 ribbon mics. There's only been one sighting I can think of at the Tiny Desk, when ALA.NI performed — in it, you can hear the vintage, silky-clean response this sought-after ribbon mic can produce on vocals. By no means is this an exhaustive list of every great microphone that's out there. Producing the audio for the Tiny Desk series is anything but a stagnant endeavor, and every act that shows up provides an opportunity to try something new. Thankfully, the technology is constantly evolving, while borrowing from the well-worn classics still being made. I can't wait to discover and experiment with my next favorite mic.